Theres a little disagreement about when it started. I think it was a little over 17 years ago and my daughter and wife say it was just over 16 years ago when we got Zippie. The difference is that Zippie was either 17 or 18 years old. Either way, she lived a long, good life. Theresa and Hope had wanted a dog and we had a good sized fenced in back yard, so one day they went to the Humane Society to look for a dog. That’s the day that Zippie won their heart. I expected them to bring home a small, little doggie, but they surprised me with Zippie. A far as we know, she was a mix between a collie and golden retriever and her adult weight was 65 pounds. A far cry from a little dog. The first thing I remember about Zippie was her dragging Hope, my daughter, around the corner of the house into the back yard. It was almost like she knew she had found her kingdom and was ready to take over and rule. We found out quickly that she loved to play ball. In fact, that’s what she lived to do. We were trying to pick a name for her and decided on Zippie because she was so fast. She would get the ball on one bounce no matter how low to the ground you threw it. And if you threw it high, it never touched the ground. She’s the only dog I ever seen that if you threw a rib bone and a tennis ball, she would bring back the tennis ball. Once when it snowed I was standing on the deck. Without thinking, I made a snowball and threw it out in the yard. It drove her crazy because she seen me throw the ball, but all she could find was snow. But she circled the yard from the outer edges in until she had covered all the yard looking for the ball. I felt bad about that but I didn’t think she would take it that serious. When I say that the backyard was her kingdom, that’s exactly what it was. Like the time when we were getting new windows put in. I told the guys working to first make friends with her because she wasn’t aggressive, but she was a great watch dog. If she didn’t know you, you didn’t get a pass into her kingdom. I also told them to watch where they laid their tools because she figured that if you laid it down in her kingdom, it was hers. They didn’t believe me at first, but after having to hunt a couple of hammers and screwdrivers, they got the message. She also loved to dig. She would dig out a hole next to the house to lay in. I’d fill in it and she would dig it back out the next day while I was at work. Between that and the stuff she chewed up when we first got her, she made life interesting and frustrating at times. But she always managed to win us back over. The last three years we have watched her grow old and go from running to walking and then stumbling. She still wanted to play ball though. On Memorial Day, we had the all American cookout with the kids. We were all out in the back yard with Zippie and four other dogs. Someone would throw the tennis ball and Zippie would lumber along to get it. We were trying to teach Roxie to fetch, but all she gets so far is run. But even though she couldn’t run fast enough and would sometimes stumble and fall, Zippie would still go get the ball and bring it back. Most of the time, she would lay on the deck with her tennis ball beside her, just waiting for someone to throw it. Wouldn’t it be great to have a passion about something like that and to be that dedicated to something? Monday we were working in the back yard cutting tree limbs and she followed us around the yard as we worked. When I sat down to take a break, she come over and sat beside me. I remember asking her how long she was going to hang around. Of course she didn’t answer, but the next morning after we all left, she laid down in her favorite morning spot and went to sleep. I believe that when she woke up, she found herself in a most wonderful place playing fetch with Jesus and his angels. We had her cremated and plan to keep her close by until we get to heaven. Then we plan to play fetch and spend eternity with her and all the other people who have trusted in Jesus as the only way to heaven. She’s already missed but not forgotten. I love the unconditional love Zippie (Y) had for us. Anytime she got out of her Kingdom, she would run until she heard the ball bounce, and she would zipp back home. That was her way of getting us exercise, she wouldn’t go far. She played a game with my Dad, pretending she couldn’t find the ball he threw, and when you came and got it out of her mouth, it made her day!! Death is a big part of my family, dealing with a pets death isn’t any different, except the whole funeral home part. It has hurt just as bad. It’s my first pet death, Zippie has just always been there. It’s so strange now. Not seeing her at the fence, and just knowing she is not in the back yard. She was always there, wanting to be loved on, and played with, sitting on my lap, not realizing how big she was, or hairy, or smelly!! I’d give anything to have her on my lap today, but I know she was tired, and her time was over. This week has been a yucky week, but at the end of the day I know that Zippie isn’t on the end table…she is in the Dog area of Heaven, which I imagine to be like what Disney world is to kids. She is making friends with not only dogs, but Hippo’s, elephants, tigers, any and all animals. She has an ABUNDANCE overload of bright tennis balls with our picture on them 🙂 And a yard made especially for digging holes. I believe God has a special place in his Kingdom for our pets, and If I’m wrong, then I’m not gonna know it when I get there myself, because No tears pass the gate. Thanks for a great comment. And I did notice the (Y) but I always did spell it the other way. Love ya later. Giving what I am about to face with my own friend, this is a beautiful, and very timely written story! Thanks for sharing. Hey Duke, Hope everything goes smoothly for you. 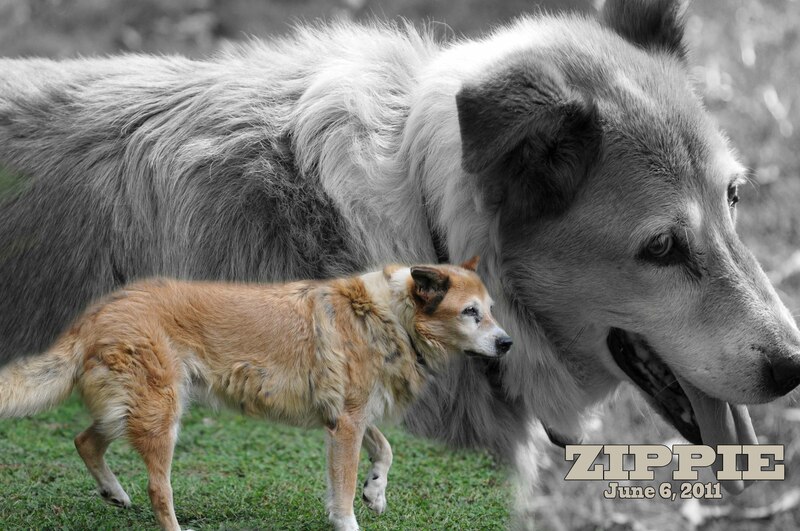 We sure hated to see Zippie grow old and the go home, but we feel good about the way she laid down and went to sleep. No matter what though, it’s never easy to say good bye when you know that you can’t say hello again quickly. God bless and see ya later.